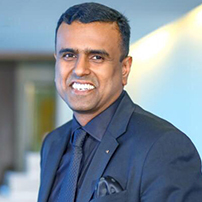 Lakshmanan Ramanathan fondly known as Lakshman, recently took over as the General Manager of The Westin Chennai Velachery. Lakshman comes with a rich and diverse experience of over 18 years in the hospitality industry, his last position being the General Manager, Courtyard by Marriott Kochi Airport after 3 successful years with strong results for the hotel. Lakshmanan began his career in the hospitality industry with Raj Vilas, Jaipur (an Oberoi resort). His association with the Marriott group commenced in 2001 and he has worked with various Marriott properties across India. Prior to Courtyard by Marriott Kochi Airport, Lakshmanan worked as the Resident Manager at the JW Marriott Bengaluru. Prior to that he was the Director of Rooms at the Renaissance Mumbai Convention Centre Hotel & Marriott Executive Apartments, Mumbai during which period he was also the board member of the rooms advisory for Marriott International in Asia Pacific. Lakshman’s immense contribution has been acknowledged at various stages by Marriott International, the highlight being the “Leader of the Year”. Lakshman takes pride in being recognized as a Pre-opening / Projects specialist. He was also involved actively in Rooms operations initiatives from Marriott International head quarters in Bethesda. Lakshman thrives working under demanding situations and is passionate about striving for excellence. He holds a Bachelor’s degree in Hotel Management and Catering Sciences and enjoys traveling, running and reading.